The state of your liver will have a huge bearing upon how well you live, how long you will live and how you will look and feel. In today’s world the liver has to work harder than ever. The liver is somewhat like the body’s digestive control center. When substances reach the liver, they’re processed and either circulated, stored, altered, detoxified or flushed away through urine and stool. The liver is the gateway to the body and in this chemical age its detoxification systems are easily overloaded. Thousands of chemicals are added to food and over 700 have been identified in drinking water. Plants are sprayed with toxic chemicals, animals are injected with potent hormones and antibiotics and a significant amount of our food is genetically engineered, processed, refined, frozen and cooked. All this can lead to destruction of delicate vitamins and minerals, which are needed for the detoxification pathways in the liver. The liver must try to cope with every toxic chemical in our environment, as well as damaged fats that are present in processed and fried foods. The liver is the cleanser and filter of the blood stream and is of vital importance. Many of the toxic chemicals that enter the body are fat-soluble which means they dissolve only in fatty or oily solutions and not in water. Fat-soluble chemicals have a high affinity for fat tissues and cell membranes, which are made of fatty substances. In these fatty parts of the body toxins may be stored for years, being released during times of exercise, stress, fasting, or weight loss. During the release of these toxins, symptoms such as headaches, poor memory, stomach pain, nausea, fatigue, dizziness and palpitations may occur. 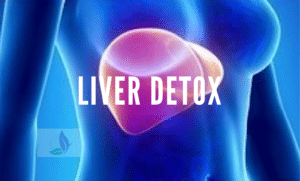 Once released, the liver is designed to convert fat-soluble chemicals into water-soluble chemicals so that they may then be easily excreted from the body via watery fluids such as the bile and urine. Basically there are two major detoxification pathways inside the liver cells which are called the Phase One and Phase Two detoxification pathways. During Phase One, the liver converts a toxic chemical into a less harmful chemical. If antioxidants are lacking, toxic chemicals become far more dangerous. During Phase Two, the liver cells add another substance to a toxic chemical or drug to render it less harmful. This makes the toxin or drug water-soluble so it can then be excreted from the body via watery fluids such as bile or urine. Eggs and cruciferous vegetables (broccoli, cabbage, Brussels sprouts, cauliflower) and raw garlic, onions, leeks and shallots are all good sources of natural sulphur compounds to enhance phase two detoxification. Thus these foods can be considered to have a cleansing action because they are so high in sulphur compounds. One of the most important antioxidants in our body with the highest sulphur containing power, is glutathione. Glutathione is the most powerful internal antioxidant and liver protector. It can be depleted by large amounts of toxins and/or drugs passing through the liver as well as fasting, stress, illness, alcohol and sugar. Boosting liver health to remove toxins from the body is an integral part of an optimum healthy lifestyle. It’s the liver’s job to help absorb the nutrients available in foods once they reach the gut and spread them throughout the body via the bloodstream and eliminate toxic waste that’s left behind. What can improved liver function do for your health? During your initial consultation with Dr. Nirvana she will develop a customized treatment protocol based upon your detox needs. At this time you will be given supplements to optimize your detoxification capacity, support your overall health while keeping you feeling energized. You will then begin IV therapy to release the toxic burden on your liver. As a multitasking organ, the liver is vulnerable to the effects of stress, toxins and processed foods. The tailored IVs will help to gently eliminate the long term and daily stress placed upon your liver. If you are interested in beginning the liver detox program, please contact the office here.